Write on this bunting with chalk to create your own special messages or designs. Each pack includes 24 bunting flags and approx. 3.8m of twine. These chalkboard paper flags can be used to create your very own bunting! The bunting flags are made from thick black paper which are shaped into pennant style flags. You can write on these bunting flags with chalk to create your own special messages or original designs; they are lots of fun! Each pack includes 24 bunting flags and black and white twine for easy threading. This bunting is a great option for crafty types or when you cannot find the celebratory message you need. You can also draw on your own designs and not include any message at all. A fun idea for a kids party is to give your child a box of coloured chalks and the flags and have them design their own bunting. This is a lovely idea for a little one who has only just started to draw as it becomes a keepsake of their first art. You do not need to decorate all flags within the pack either, they still look great with only a few flags drawn on. These chalkboard paper flags look great at a construction party, camouflage or army themed party, ladybug party, Mad Hatters Tea Party, safari party and more! 24 bunting flags is more than you will need if you are wanting to decorate a smaller party space or add a bunting behind a party table or buffet. This will give you some spares which you can use next time or in case you make a mistake. Whilst you will be able to wipe the chalk from the black paper, it will leave a chalky smudge so you may find you want to use the backs of the paper if you reuse the bunting again. These are a great price and a good size so you can have fun with it either way! 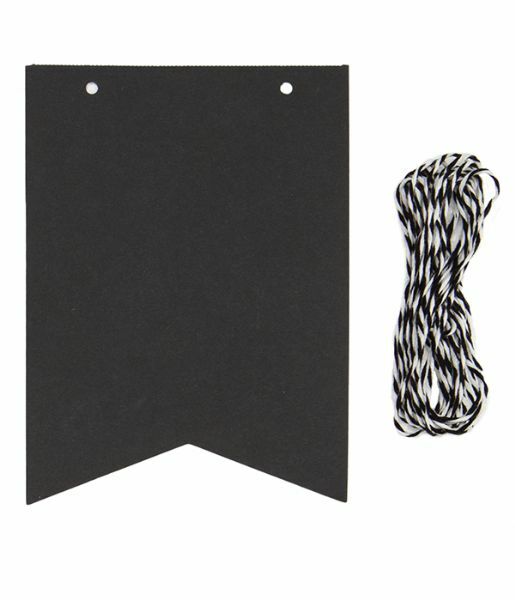 These chalkboard paper flags qualify for our small item shipping fee! If this is the only item in your shopping cart then our small item shipping fee will apply.